Bike Week is looking for organizations, community groups, or individuals who would like to coordinate their own event during Bike Week. We want Bike Week to be infectious and we want to have more events for people to take part in. Our goal is to engage everyone that rides a bike and so variety is key. The possibilities are endless: group rides, races, history events, pajama and ice cream ride for kids, concerts with bike valet, art shows, infrastructure seminars, discounts for cyclists, bike decorating, scavenger hunts, markets, costume balls…. the sky’s the limit! This is a unique opportunity to promote your organization to a new audience while supporting a grass roots initiative that encourages cycling for recreation, transportation, and sport. Everything we do is for the love of riding a bike. How do you host your own event? In return, we’ll help promote your event by including it on our calendar, website, social media and e-newsletters. 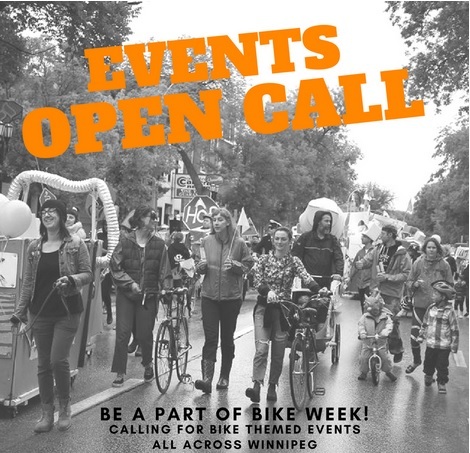 We’re also happy to provide expertise on biking in Winnipeg and how to run a successful event—and maybe a few volunteers or experts to help you on event day— just ask! No idea jumping to mind? We have a list of possible events that we can send you to help start the brainstorming. Learn more about by our week long celebration by perusing the website or contact our Event Producers Fête Jockey fetejockey@gmail.com with any questions or to register.